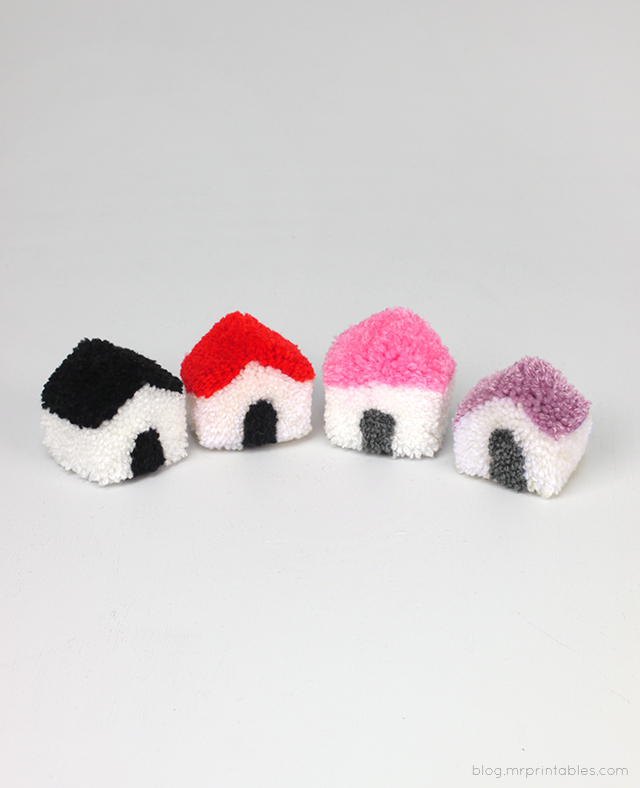 Pompoms are soft and friendly, they are the perfect size and softness for little hands so it makes a lot of sense to make some pompom soft toy play sets. 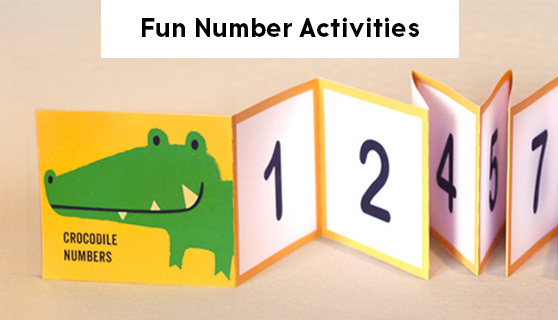 They are also the easiest things to make. I don’t know how to knit or crochet but a complete novice with yarn like me can make pompoms! I get asked for video tutorials these days but I struggle with time so creating the usual step-by-step images is probably my current limit. So apologies for the lack of videos! I’ll try to explain as clearly as possible (without making the post too long ^ ^ ) and you’re very welcome to ask me questions in the comments. However, I must mention that I’m a beginner myself trying things out too so please take these steps as a ‘rough guide’ to try out yourself. I’m sure if you make some easy ones at first, add a few details one by one and experiment with trimming, you can soon figure things out! I’m so impressed with the pompoms many of you’ve made that I see on instagram and elsewhere. I now regularly get asked what kind of yarn I use. I bought some acrylic double knitting yarn at the beginning as it seemed wool yarns might be wasted. Now because of the lack of color choices I looked further and bought some wool yarns the other day and ooh, the resulting pompoms are just so much nicer to hold and the colors are more sophisticated. I love the soft bouncy feeling of pompoms and I think I’ll stick to wool yarns from now on. Babies must love holding these. I saw cashmere and merino yarns in the shop (even nicer colors!) but must stay away from them for now until I make very special gifts. I haven’t tried very thick yarns or thin ones yet. OK, I’ve talked too much (hope it’s useful) so now to the tutorial. 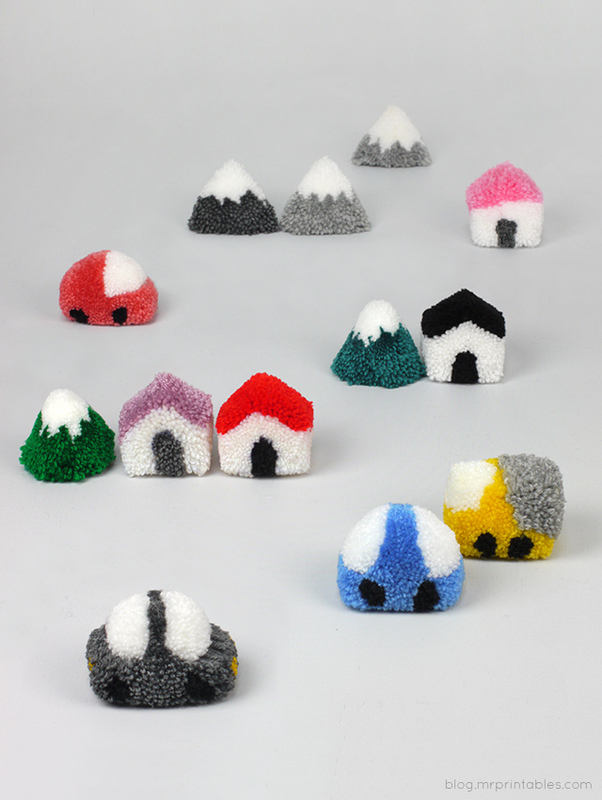 I’ll be introducing more pompom toys here you can make but little houses and vehicles are easy to start with. As with other pompom posts, I’ll skip some basic steps so if you’re new to pompoms please start here. 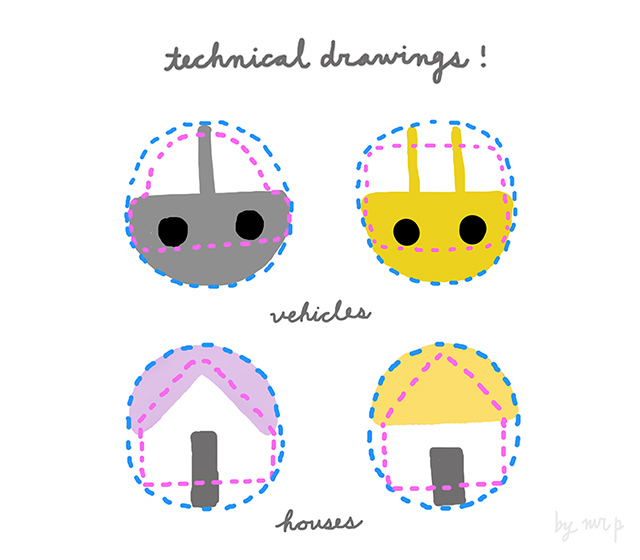 Firstly, here are some very serious technical diagrams for the pompom houses and cars. As you can see, you need to make round pompoms as usual (marked in blue dotted lines), then trim them to the final house or vehicle shapes (marked in pink dotted lines). On paper draw your symmetrical design first, then draw a circle around it. Extend the color & shape to the edge of the circles and make a normal round pompom first according to that diagram. If you’re unsure what I mean by a diagram, check out this and this. 1. Wrap a couple of layers of yarn for the door. Then wrap the house color over it. If you want to make a triangle shape for the house facade, start with one wrap at the top and add more as in the photo (above right). More on this technique is on the alphabet pompom post. 2. Now wrap the rest with the roof color. Make the other half in the same way but without the door, unless you’d like a back door! 3. The final pompom comes out as a round fluff ball. Firstly, trim the front of the house flat with your scissors vertically against it. Then trim the sides, back and bottom the same way. Trim the roof into a er, roof shape. 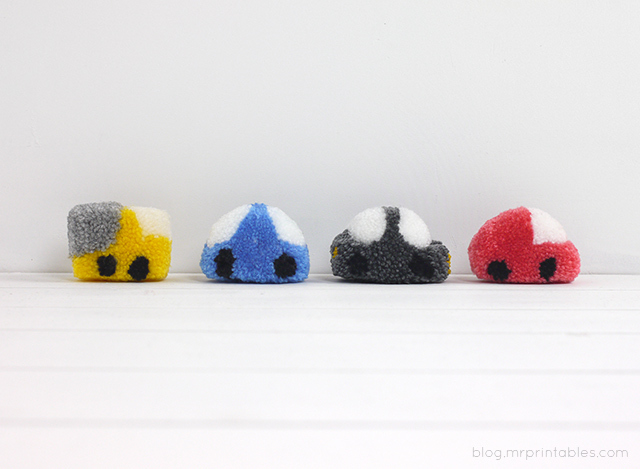 Done and now moving onto little pompom cars. You can create many different car designs. Some wheels and a window or two will make a car! This step-by-step tutorial is for the top left car in the diagram above as one example. 1. Wrap the car body color (let’s say grey in this case) in one layer all along the pompom maker. This creates the vertical line between the windows in the drawing. Wrap more on the bottom half to create distance between the wheels (above left). 2. Wrap some black yarn to make wheels. When you cut it open later, this will create 2 wheels. Wrap plenty of white yarn (or whatever window color you’re using) on the top half. 3. Wrap more grey to cover the bottom half on top of the wheels. As an option, wrap a bit of yellow on top for the headlights then cover it up with more grey. 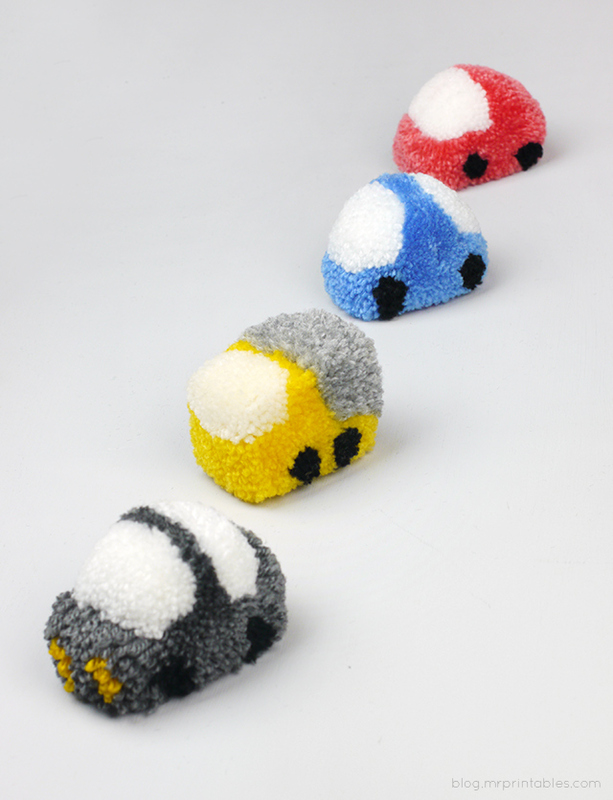 Now you’ll need to repeat exactly the same thing for the other half of the pompom maker to make a symmetrical car and then put the two halves together. 4. 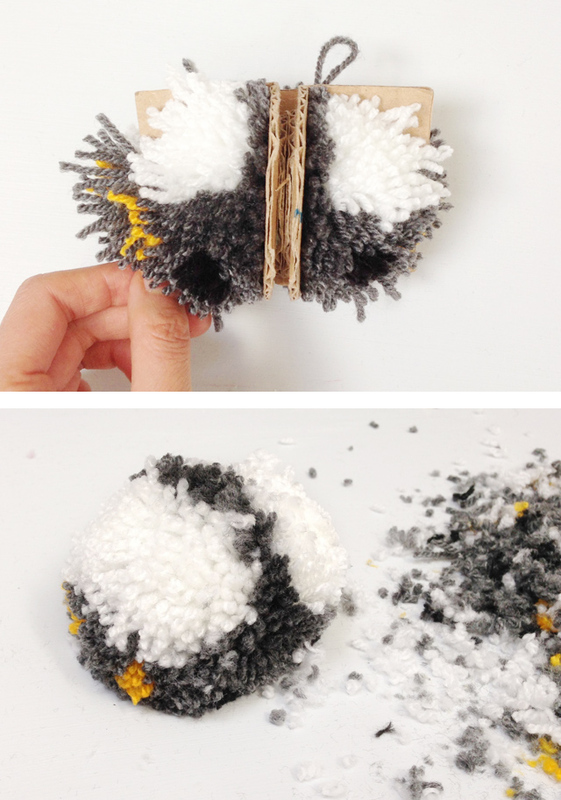 Cut open the pompom and tie up. Trim the bottom flat so the wheels touch the ground and trim the top into any car shape you like. It could be a dome shape, square etc. With a bit of an initial trim, you can see the car shape but it will be quite rough like the one above. If you want a more dense and defined car, just keep trimming…! On a side note; I’m working on an exciting new project, called Rock & Pebble, our very own lifestyle and toy brand!! It’s taking lots of time but I’m working on a couple of first products to launch soon. Hop over and sign up for the newsletter if you’d like to hear more when we launch. Can’t wait to show you all what they are! that’s absolutely blowing! how skilled and creative you are! Love this, thanks for sharing! I like the houses and the mountains! 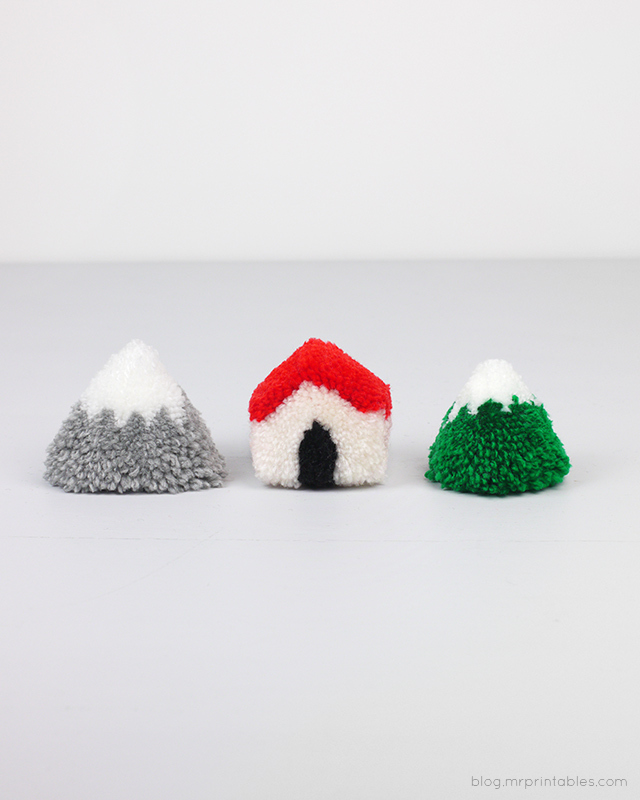 Now, you can play in the village with all your pom pom animals! So awesome! Hi Ali, I’ll try! I ran out of time. ^ ^ Either I do another post (maybe a winter scene with the mountains) or I’ll try to add it here when I can! The little mountains are my favorites too! I have already seen animals in pom pom (maybe here???) but I have never seen a city like this! Very fun! This is such an incredible site! I love all your great ideas and my class does too. Thanks for your time and generosity in sharing with us. Please keep them coming. I can’t help a!so commenting on your website. It is wonderfully designed. Thanks so much. This is my very favourite new thing! 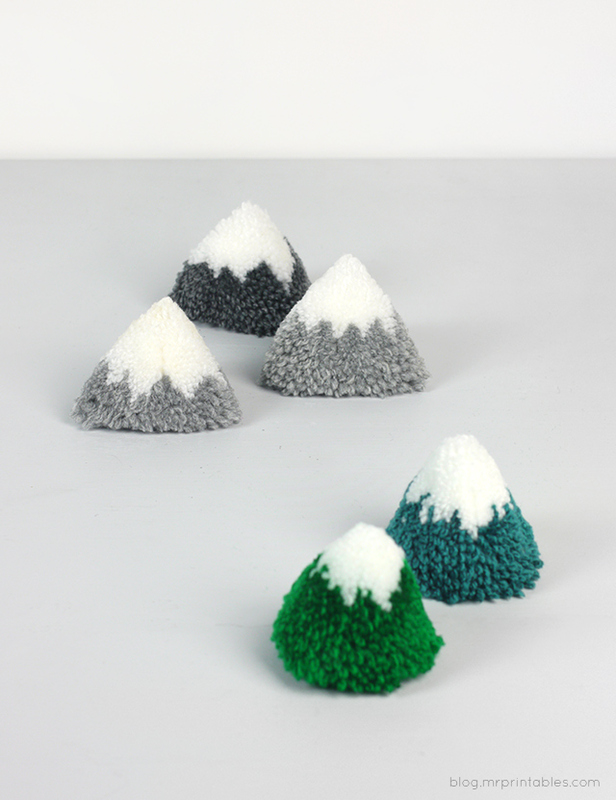 Please do a diagram for the mountains they are so cute and I just can’t work it out. I just love all of your pom poms!!! You are so wonderfully creative. I would also love to see a tutorial for the trees. I am trying to make a village for my granddaughter to play with. Thank you so much for these fun cuties! Thanks for your kind comment Cheri! ^ ^ I’m a beginner crafter and I’m starting with pom poms before I learn to knit/crochet! yes a tutorial for the mountains !! So cuuute ! I love it ! I can’t seem to get the houses right even after I trimmed them. Any tips? 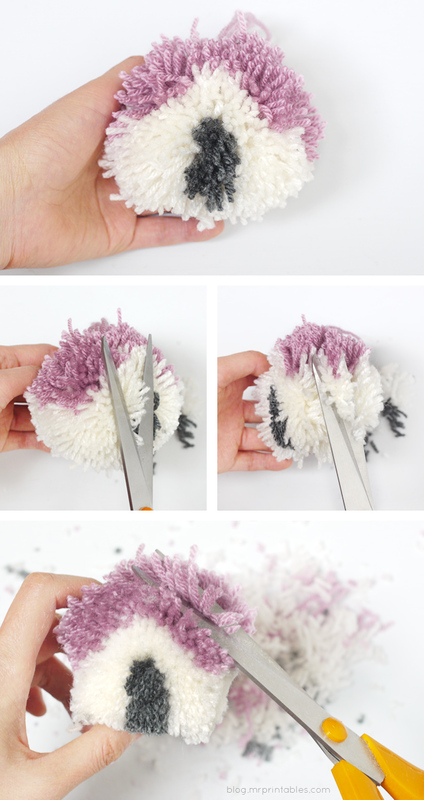 Okay, I’ve been reading ALL of your pompom tutorials—you are brilliant! I can’t wait to try some ghosts for Halloween! And maybe some candy corn, to try the pointed shape. Then poinsettias, ornaments, and presents for Christmas, maybe… and stars, and snowflakes (probably simple ones! )… oh, I am SO excited!!! Thank you so much for sharing (and your photos are lovely)!! BTW: I tried a ghost with bulky white wool yarn versus thin silky bamboo-acrylic hybrid and have decided that I DEFINITELY need to use the same type & weight of yarn for the whole thing if I want it to behave (the eyes, in particular, tended to meander into the shape of asterisks * or scraggly flowers). Plus I kind of trimmed it too much… XD But it was super fun! Thank you again for sharing your talents! HI. My teacher is teaching me how to do it. how do you do it? 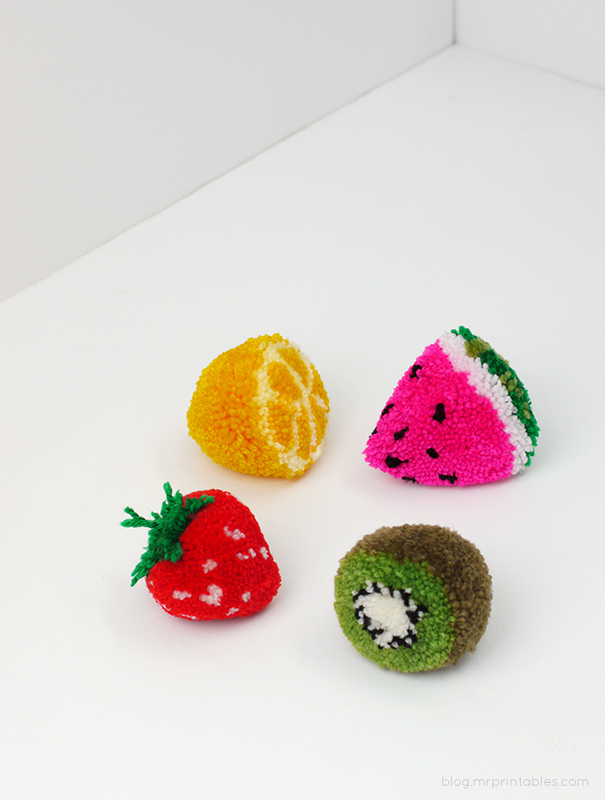 do you like doing pompom? Hello! This is nice!!! I already bought some yarn and this weekend I’ll give it a try. But please, could you explain how to do the mountains? Do you have a more detailed tutorial of the grey car? I can’t see the shape of the pompom maker so I don’t know how to start.